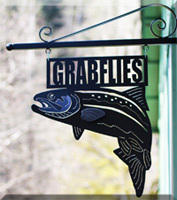 Black Magic Muddler by Grabflies. 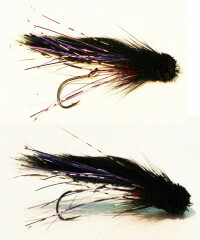 A very good summer/fall Steelhead Muddler Minnow pattern. Design for rivers like the Klickitat and Deschutes. This muddler is tied on a shank with a trailing #2 Owner hook. Trailing hooks are much better for tail nipping takes and when barbless stay hooked much better, plus do much less damage to wild fish for releasing. Fly is 1.5 to 2 inches longer. Fishes very high in the water column on a dryline. This muddler has lots of action.